Here's a different way to look at Apple's latest iPhone. On Sept. 12, Apple (NASDAQ:AAPL) announced a long-awaited trio of new iPhones. Aimed squarely at the ultra-high-end portion of the smartphone market were the iPhone XS and its larger counterpart, the iPhone XS Max. These start at $999 and $1099, respectively, and are the company's most advanced iPhones. Starting at a more accessible $749 price point is the iPhone XR, which was announced alongside the iPhone XS and iPhone XS Max but won't hit store shelves until Oct. 26. The device shares many core technologies with the iPhone XS and iPhone XS Max, such as the A12 Bionic chip, the TrueDepth camera system (which enables features like Face ID and Animoji), and the upgraded rear-facing wide angle camera. However, since the iPhone XR is designed to sell for less than the iPhone XS and iPhone XS Max, the company needed to make some trade-offs to keep the bill of materials low enough that Apple could earn its desired gross margin. Those trade-offs include using a liquid crystal display (LCD) instead of a pricier organic light-emitting diode (OLED) screen, providing less system RAM, omitting 3D Touch and a telephoto lens, and using cheaper aluminum instead of the stainless steel of the iPhone XS and iPhone XS Max. Although it might be tempting simply to think of the iPhone XR as the "cheap" iPhone option (and, technically, that's true -- it's significantly cheaper than either the iPhone XS or iPhone XS Max), I think there's another way that investors and consumers alike might want to view the iPhone XR. 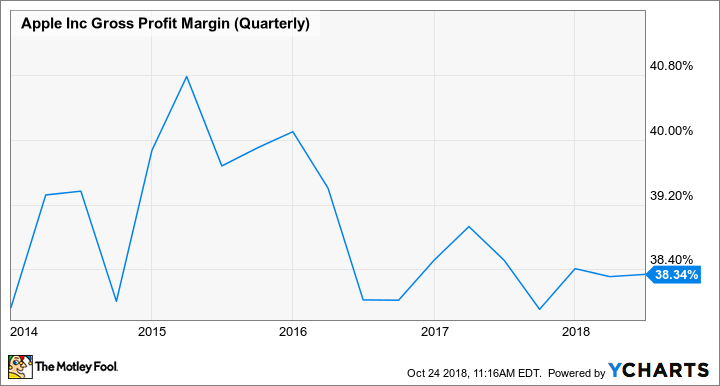 Apple needs to deliver the kind of gross margin percentages that investors expect (which are ultimately in service to the kind of net income that investors want to see), but at the same time it needs to be sure to deliver those gross margins while aspiring to keep revenues moving in the right direction -- up. In theory, Apple could jack up the prices of its products a lot and there would still likely be some takers, but I'd imagine that there'd be far fewer of them, leading to a dramatic decline in unit shipments and, quite likely, overall revenue and net income. What all of this means is that every product Apple builds needs to be the product of a smart set of trade-offs that make it desirable and competitive while at the same time allowing Apple to enjoy its desired gross margin percentage. With that in mind, I think of the iPhone XR as Apple's vision of the best product it could deliver for $749, given the numerous economic and technological constraints it's working under. Where do the iPhone XS and iPhone XS Max fit in? When Apple introduced the iPhone X last year, the device was significantly more advanced than either the iPhone 8 or iPhone 8 Plus -- and more expensive. The higher price tag allowed Apple to deliver a product that included more expensive components and features like an OLED screen, stainless steel casing, optical image stabilization on both rear-facing cameras, and the company's TrueDepth camera. And, as it turns out, many iPhone customers were willing to pay extra for those features. Now, not every iPhone buyer is willing or able to pay between $999 and $1449 (the price of the iPhone XS Max with 512 gigabytes of storage), but quite a few of them are. For those customers, it makes sense for Apple to build products more expensive than iPhones have historically been. Ultimately, one way to view Apple's lineup is not to see the iPhone XR as the cheap model -- a smartphone that starts at $749 and goes up to $899 is anything but cheap, as smartphones go -- but to see it as the iPhone that Apple would've likely released had it not figured out that many iPhone customers were willing to pay more for higher-end models.